A play by Sophocles, in a new version by Frank McGuinness, performed at the McCarter Theatre, Princeton: 15 September - 4 October 1998; transferred to the Ethel Barrymore Theatre, New York: 3 December 1998 - 21 March 1999. The photo shows (from left to right) the Chorus (played by Myra Lucretia Taylor), Electra (Zoë Wanamaker), and the Chorus of Mycenae (Pat Carroll). Electra is an Ancient Greek tragedy. When the Greeks prepared to war with Troy, King Agamemnon was prompted to sacrifice his daughter, Iphigenia, in order to appease the gods. After returning home from battle victorious, he was then murdered by his wife, Clytemnestra. She killed her husband after entering into a secret pact with Aegisthus, her lover and cousin to the King. Horrified by her father's slaughter, Iphigenia's sister, Electra, sent her young brother, Orestes, into hiding. As Electra opens, many years have passed since the brutal killings, yet the memory of Agamemnon's bloody demise is as fresh in the title character's mind as the desire for vengeance. When Orestes returns home unexpectedly, events move swiftly as Electra seizes her chance to punish their mother and step-father. Following their highly acclaimed staging of Electra in the UK, Zoe, director David Leveaux, and several other crew members brought the play to the USA, where it was also an outstanding success. 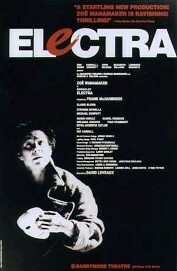 Playbill called Electra '[o]ne of the few unadulterated hits of the Broadway season' - the sell-out production was so well received that its run at the Ethel Barrymore Theatre was extended by two months. The popularity of Electra with audiences and reviewers alike confirmed Zoe's belief that '[a]ll of what Sophocles wrote speaks to us today', despite it being a product of antiquity (see 'A Daughter Takes Up the Mantle' interview). As Zoe sees it, 'we are constantly confronted by the story of Electra' (see the Commentary in Electra: A New Adaptation By Frank McGuinness). 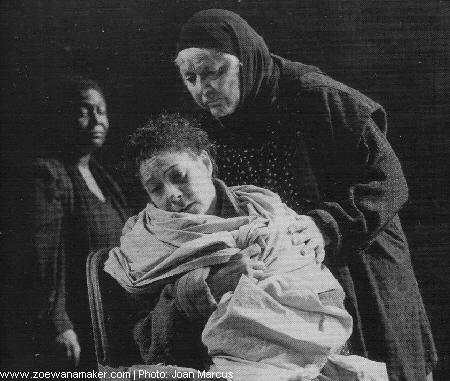 The production invited audiences to compare Electra's emotional anguish with the suffering experienced by the children of war in recent times. During the Broadway run, Zoe discussed the parallel and war's devastating effects: 'Electra is a product of war. She's grown up seeing her father murdered in front of her eyes. Wouldn't you think that would have changed her life? Think of the children of Northern Ireland, of Bosnia... What do they grow up to be? What kind of adults will they be?' (see 'Zoe Wanamaker, The Electric Electra London Actress Returns to B'way' interview). In an interview for BOMB Magazine, she discussed in detail her response to the play. 'I saw the suffering in Electra as that of a country’s suffering; I saw joy, life, energy, passion - all that settled inside me. That grief is active, things happen to you physically,' she explained. As a consequence of playing 'a very physical part' in 'a very physical production', Zoe was understandably exhausted. When she was performing Electra on Broadway, a chiropractor suggested a novel way of coping with the gruelling role. He advised Zoe to 'find something, some object, a doll or something. Call it Electra, and put it in [her] dressing room and don't take it out; after the show, just leave it there'. The object she selected was an old photograph of a girl that resembled her as a child, given to her by the production's designer, John Engels (see Zoe's comments in the 'Complex Electra' panel discussion). In recognition of her powerful performance in a classic play, Zoe won the 1998 Joe Callaway Award. She also received a Tony Award nomination for Best Performance by a Leading Actress in a Play, while Electra was nominated for Best Revival of a Play. Zoe's other Broadway appearances include Piaf (1981), Loot (1986), Made in Bangkok (1988), and Awake and Sing! (2006). In the light of her success in Electra, Zoë 'must now be regarded as the greatest British classic actress of her generation,' asserted the New York Post's Clive Barnes. She is 'astounding' as Agamemnon's daughter, in the 'proverbial performance of her career', enthused Peter Marks in the New York Times. Her 'portrait of the avenging daughter is definitive', he remarked in an earlier review. 'Zoë Wanamaker's Electra is a miraculous achievement – one of the finest performances I've ever seen,' praised John Heilpern, writing for the New York Observer. He added that Zoe's 'magnificent performance stands comparison with anyone's, and stands alone'. The production 'is pure joy, pure beauty, pure perfection', concluded David Roberts at Theatre Reviews. Other positive reviews include: Vincent Canby in the New York Times, Elyse Sommer for CurtainUp, Joseph Hurley in the Irish Echo, Celia Wren in Commonweal, Richard Zoglin in TIME, Katharina Volk in Didaskalia, and Cary M. Mazer at the University of Pennsylvania.